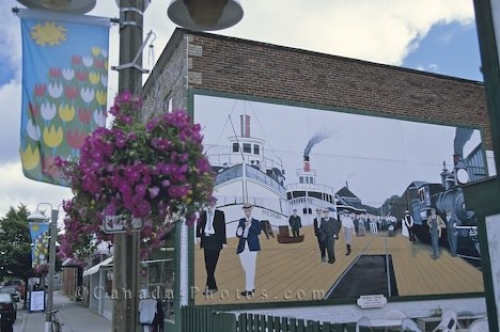 Gravenhurst, Ontario is a pretty little town with a historic mural on the side of a building and quaint streets. Flowers hang on the lamp posts with tulip banners on each one and beautiful wall murals are what makes up the charm and peacefulness that surround the town of Gravenhurst in Ontario, Canada. Small shops line the streets of the downtown area of Gravenhurst which is known as the gateway to Muskoka. Gravenhurst, Ontario, Canada, North America. Picture of a mural on a building wall along the streets of the town of Gravenhurst in Ontario, Canada.